If you are using Einstein Analytics to analyze your Salesforce data, your capabilities just skyrocketed. 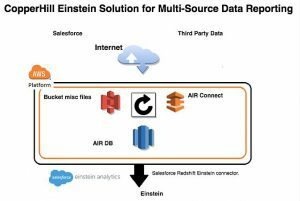 Now, you can use the same self-service Einstein Analytics tool to analyze ALL of your business data – even the data outside of Salesforce – through a new and powerful connection with AIR Redshift. CopperHill recognizes that most businesses have more than three data systems, including financial information, website and email activity, and Salesforce data. To enable its users to get full insight and the most out of their investment, Einstein Analytics chose to partner with CopperHill Consulting. With the combination of Einstein Analytics and AIR Redshift you can continue creating your own datasets, generating custom reports, and gaining actionable insights into your company’s activities, but now you are no longer limited to just the data stored in Salesforce. The first step in the process is to identify all the disparate systems and silos of data within the company. For example, we may find that a company has the following silos of data: an accounting system, a custom project management application, website data, email data, and a lot of Microsoft Excel spreadsheets. The AIR Redshift uses a module within the AIR platform called AIR Connect to bring all of your different data systems together. AIR Connect not only automates the integration of data from one system to another, but also pushes that data from disparate systems into a single Redshift data warehouse. Once the different silos of data are loaded into Redshift, data transformations can occur and aggregated views can be created. The final step involves configuring the Amazon Redshift Connector that comes with Einstein Analytics to create powerful datasets where you can use Einstein to explore and analyze all of your company’s data. This connector can be scheduled to refresh the datasets that are being stored inside Einstein on a monthly, weekly, or daily basis. Now, with all your data visible in a central location, your company can make better decisions because you are blending and transforming the data from systems that you need to run your company, which gives you a bigger and clearer picture on how your business is doing. What does this mean to you as a Salesforce customer? Time savings. Clear insights. Better decisions. You now have an automated solution to blend all your data into one central location without any need for human intervention. You can leverage standard, out-of-the-box operational reports and dashboards to quickly give you insight into all areas of your business. You will easily be able to see what is doing well and what is not doing so well across your entire organization. You can continue to use Einstein Analytics as your analytical visualization tool to explore all of your company’s data without investing in other Business Intelligence tools. Now, you have better insight into how your business as a whole is doing, and proactively answer complex business questions by integrating, blending, and preparing your data in AIR Redshift. Learn more about CopperHill AIR or contact us to learn how this can help you!